This weekend’s schedule can’t touch last weekend when it comes to anticipation for big games but there’s an outstanding chance this weekend features more drama than what we got in Week 10. 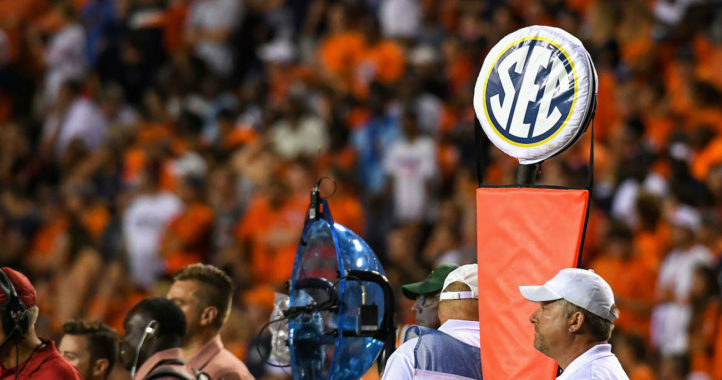 Looking ahead to the Saturday slate, here’s our weekly predictions and bets for the upcoming SEC action. 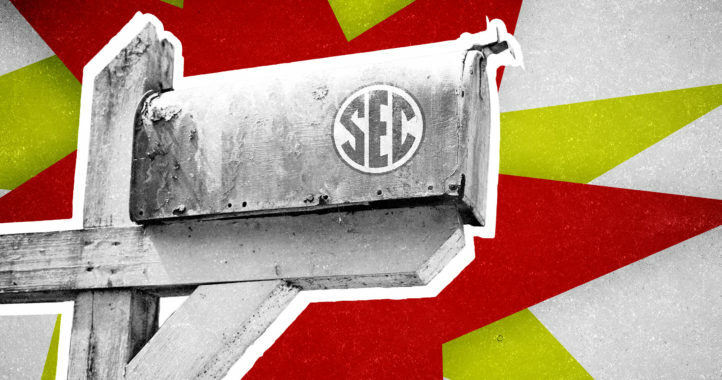 As always, it’s news desk editor Michael Bratton (@MichaelWBratton) and SDS Podcast co-host Chris Marler (@CMarlerSDS) making the weekly SEC picks against the spread. Michael went 3-2-1 against the spread last weekend. His against the spread record for the season is 43-27-1. Chris went 2-3-1 last weekend, giving him a season total of 33-37-1. Michael: The Rebels started the season hot but they appear to be shooting nothing but blanks during crucial situations at this point. Look for that to continue in College Station. Yes, the Aggies blew a game last weekend at Auburn but Jimbo Fisher didn’t seem to lose his cool following the game, noting that’s part of the growing pains of taking over a new program and establishing the culture necessary to succeed in this league. I doubt there are any panic buttons being hit in College Station at the moment and predict this game will show that. For all the negatives that came out of last weekend’s game, Trayveon Williams continues to assert himself as the leader of this Aggie offense. The Texas A&M back nearly carried this team to success against Auburn and very well could do the same in this matchup, if need be. I doubt that level of brilliance will be needed against a defense of Ole Miss’ caliber but Fisher has got to rest easy knowing his star tailback can take over an SEC game when called upon. Chris: The only thing weaker than Ole Miss’ defense is UCF’s strength of schedule. However, it was the offense that may have been most disappointing last week as they only gained 16 yards in the 4th quarter after racking up 600 in the first 3. Texas A&M also comes off a bad loss blowing a 10 point 4th quarter lead to Auburn. Trayveon Williams might rush for 300 yards on this defense, and we all know the Aggie rush defense is one of the best in the conference. However, that secondary has been terrible. Texas A&M’s defense is allowing 243.6 passing yards per game, which ranks 11th in the SEC and 83rd nationally. Ole Miss is ranked 1st in the SEC and 4th nationally in pass offense at 352.8 ypg. This seems like a lot of points to cover for a team that hasn’t finished above .500 in November since 2012 or scored over 30 points since Week 4. Michael: Tennessee isn’t as bad of a team as it looked against Charlotte. While that’s true, Kentucky isn’t as bad as it looked against Georgia, either. This game on Saturday will likely come down to which team wants it more in Neyland Stadium and if the Wildcats don’t come in deflated after losing the SEC East last weekend, they could run the Vols out of their own building. For any Tennessee fans that aren’t buying into the Kentucky hype, be prepared to be introduced to a man named Josh Allen this weekend. Based on the Vols’ issues blocking all season long, not just the offensive line but the team’s tight ends and running backs, too, Jeremy Pruitt’s team will have no answers for a player that has been unstoppable all season. The only hope for Tennessee is if Jarrett Guarantano can connect on some deep balls in this game. That being said, Kentucky has the SEC’s passing defense on throws 10 yards or longer beyond the line of scrimmage. Chris: I was shocked when this line opened at 4.5. I mean sure, Kentucky is coming off a tough loss against UGA, and sure, they only have 5 wins in the month of November since 2013 which is last in the SEC. Jarrett Guarantano has been great at QB throwing only 2 INTs all season which is the fewest in the SEC. However, what I saw/ was subjected to last week in that Tennessee game vs. Charlotte was jaw-droppingly bad. Tennessee averaged .8 yards per carry rushing the football. They ran 26 times for 20 yards vs. Charlotte. CHARLOTTE! And, I don’t care if Charlotte had “the 6th best rush defense in the country.” They also had played the 126th ranked schedule in the country to achieve that stat. This is a good spot for Tennessee at home, but honestly, the Vols offense scores less than someone rocking a turtleneck and adult braces. Michael: I’ve been down on Auburn all season and wins over Ole Miss and Texas A&M still haven’t sold me that this team is anywhere near Georgia’s caliber and that’s even considering the Bulldogs aren’t quite as elite as I figured they would be entering the season. That being said, the Bulldogs — even before the started peaking — are so beyond Auburn at this point, this one could be over at the half. Don’t be surprised if Justin Fields gets more run in this game than in any other since the Tennessee game. My only concern is how young the Bulldogs are and considering the East has already been won, there is a slight chance of a trap game here for Kirby Smart’s squad. With Georgia very much in the thick of the College Football Playoff run, I’m not too concerned. The Dawgs win this one running away. Chris: This is by far my favorite rivalry in college football. I said when UGA lost to LSU that it was not a bad loss and couldn’t have come at a better time. The Dawgs have looked much more like the 2017 version of themselves and posted back-to-back double-digit wins vs. Top 10 opponents. Auburn’s offense thrives on misdirection and inefficiency. Last week they managed only 19 yards rushing which was the fewest rushing yards in a game they won since 1967. They’re going to have to stretch the defense with the passing game in order to have a chance at winning this game. UGA’s O-Line is beaten up and will face a really good front seven. I think UGA wins, but not by two TDs. Michael: I nearly predicted Alabama’s points dead-on last week, just missed LSU’s by only four touchdowns. This week, I’m feeling even better picking against Alabama but I won’t be picking the Tide to lose outright, just to fail to cover. We’ve started to see signs of life from Mississippi State’s offense and if Joe Moorhead’s offense has begun to click, it could threaten this Alabama defense. Nick Fitzgerald has had some real success in recent weeks and if he continues to maintain consistency through the air, MSU’s offense looks night and day different. Now on the other side of the ball, Bob Shoop loves to bring the heat and Hail State has the personnel to get pressure on Tua Tagovailoa and not give him all day to throw the ball. The issue for Mississippi State is its defensive backs don’t match up well at all with the Tide receivers. Alabama’s receivers will have a ton of success if Tua can put the ball on them in this game. MSU could make things interesting in this game for about a half but the Tide will hit them with enough big pass plays to pull away in the end. Chris: Mississippi State’s defense has been dominant this season. It may be the first time since Saban has been at Alabama that he comes into this game without the best defense on the field. The Bulldogs ranks in the top 10 nationally in scoring defense, pass defense, and total defense. They’ve only given up nine TDs all season and their opponent’s TD percentage in the red zone is only 21.7% which also is best in the country. That could have a huge impact if they force Alabama into FG attempts which, outside of Democrats, is the biggest nightmare for Alabamians in 2018. All that being said I don’t see this game being very close. Nick Fitzgerald and this offense have put up 10 total points in conference road games this season, and Mississippi State doesn’t have the playmakers at WR to challenge Bama’s defense. Also, how do they stop Tua for four quarters? They don’t. Michael: This line appears to be a wild overreaction to Mizzou’s big win over Florida. Keep in mind, this is still a team that’s won only one SEC game one week into November. Vanderbilt is coming off a big win of its own at Arkansas and has had two weeks to prepare for this matchup. Ke’Shawn Vaughn may be the most underrated running back in the league and now that’s he’s healthy, I like Vanderbilt to score enough points with the balance he helps bring to the offense to keep this game interesting. Something to keep in mind, Missouri’s All-SEC tight end Albert O was hurt last week and may miss this game. Without him, the Tigers are down their biggest red zone threat. The Tigers get the win but not by 17 or more. Chris: Death. Taxes. And, Barry Odom in November baby! Is that a thing? Probably not, but the man is 5-0 in last 5 November games. The only person excited about an 11 AM Vandy & Mizzou game is my fiancé because it means we’ll probably just watch a Fixer Upper marathon with Chip and Jo instead. This is a weird line for this game. Granted Mizzou did beat the brakes off Florida and earn their first road win against a ranked team since 2014, but 17 seems high especially since Vandy is 3-1 ATS on the road this season. The impact players for this game are Emanuel Hall and Kyle Shurmur. Shurmur has thrown 5 INTs over the last 2 seasons vs. Mizzou. And, Hall is a huge difference maker for this Tiger offense when he’s healthy. Michael: Turmoil in the locker and uncertainty at the QB position sure do make for easy selections when picking against the spread. When it comes down to comparing a team that’s won back-to-back league games in the fourth quarter, with the latest one coming on the road in a hostile environment, or a team that’s looked worse each week and has little to play for with speculation of fights in the locker room, these picks basically make themselves. Jake Bentley has also hit his stride at the worst time for the Gators, as Florida’s defensive backs have been really struggling in recent weeks. Unless the Gators dominate this game on the ground, I like South Carolina to not only cover but get the win in this matchup. Chris: Last week is a perfect example of why Florida can’t have nice things. We give you sunshine and beaches and what do you do Florida man? You invent bath salts and denim leisure wear. As bad as they looked last week I still like Florida’s secondary in their matchup vs. Jake Bentley. And, who knows what to expect from Florida at the QB position. My gut says Florida, but I’m worried they’ll roll over if they get off to another bad start like last week. Florida is only averaging 2.9 points in the 1st quarter of games this year which ranks 123rd nationally. I want to pick Florida to cover because they’re the better team and have won 9 of their past 11 at home vs. Carolina. However, that press conference from Dan Mullen trying to dismiss locker room dissension worries me. Michael: If Arkansas doesn’t show up for this game, they might as well call it a wrap on the season. In what will be the only true night game at home this season, the Razorbacks have an opportunity to shock the SEC by getting an LSU team that could that just suffered a loss that knocked them out of contention for the SEC Championship. While LSU should have a huge advantage on the defensive side of the ball in this game, the Razorbacks have been finding ways to manufacture points on every league opponent since the Auburn game back in late September. The danger in this matchup for the Razorbacks will be the running game of LSU, if the Tigers are humming in that aspect, they will be tough to beat. Ed Orgeron is undefeated in his LSU coaching career coming off a loss, I like that streak to continue but I don’t expect it to be easy. Chris: This is honestly the only game I feel confident in picking. LSU is coming off a demoralizing loss at home to Alabama. Arkansas is coming off a demoralizing 2018 season so far. Arkansas leads the SEC in turnovers with 19, and LSU leads the SEC in turnovers forced with 20. To be fair, LSU’s offense has a lot of issues. They rank last in the conference and 112th nationally in yards per play at 5.13. It won’t matter. LSU is 7-0 under Coach O when coming off a loss. They’ll roll in Fayetteville. No way on God’s green earth MSU holds Alabama to 33 nor will they score 17. And what in the world makes you think Arkansas-LSU will be A 4 POINT GAME? 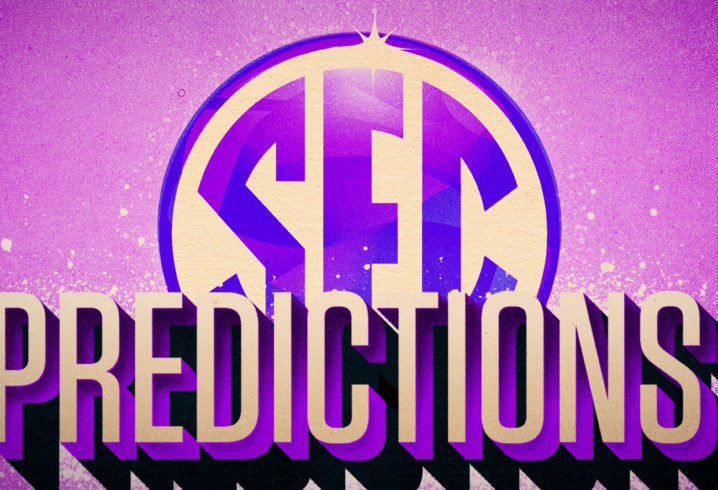 Are you trying to make the most idiotic predictions of the week? My God, you really think LSU is going to let Arkansas of all people score 23? Say, who you buyin’ that stuff from? Seems to work quite well. I think he may be predicting a let down for LSU and Bama after a tough game. I know, and that is far too big of a letdown. That game was so one-sided that it’s not like there’s any mental aspect coming off of it except for the thirst for blood by LSU. Besides, LSU’s used to losing to Alabama. Yep. And LSU put up 36 on Georgia, while failing to score against Bama. Bama’s outlier resulted in a 34 point win. Georgia’s resulted in a 20 point loss. So, what’s your point? His point was it’s not impossible or even far fetched to score on Alabama. Why did that hurt your feelings ? It’s a valid observation. jay.cardea….. That wasn’t his point. Look at his posts. He has done nothing but troll Bama since the LSU game. AUforever…. Auburn just gave UT their first Conference win in two years…. LMAO. Probably because we scored 31 on BAMA. Which you Georgia bulldogs may be able to score 20 on them. Worry about your own team brotha. I wouldn’t read too much into scoring 31 on Bama. Hogs also scored 31 on Vandy and no one is going to attempt to equate Vandy’s defense to Bama’s. Also, Hogs scored 3 versus Auburn and 17 against North Texas. Transitive property is a poor evaluation tool. Buddy your team is a laughing stock that no one respects..
Not calling for a win or expecting one, but the Ark LSU series is really weird sometimes. I’m fairly certain Tua has thrown the least amount of INT this season, not Guarantano. That’s why everyone made such a big deal when it finally happened….five days ago. State’s defense has been great this season. It’ll be interesting to see how it does against an effective offense though. AU offense = Misdirection and inefficiency. Ha! I’m gonna steal that one. Bigger concern is defense. Watching Garantano torch the secondary, Fitz run for almost 200 and Trayveon Williams bust huge plays last week, this one could get ugly early. I feel like if Albert O can’t play, the Mizzou/Vandy game will be a little bit low scoring. But if the same Mizzou defense that has showed up lately takes the field, it PROBABLY doesn’t matter much. Something like 24-14 sounds about right. 2) Have someone else write your reports. What an embarrassing attempt at journalism. Tua has 1 INT, which is less than 2. UGA O-line will be healthiest since Missouri game since Ben Cleveland is back. Thank you so much for the read. I misspoke, Tennessee has the fewest amount of INTs in the SEC as a team not Guarantano individually. Glad to hear the O-Line had such a speedy recovery. Feel free to write my reports whenever you want. Aggies 42, Ole Miss 35. Essentially the same as last game for the rebs. The Dogs defense should be good enough to hang with the Bama offense, at least for a little while, but my worry is the offense won’t be able to move the ball and the defense will wear down from being on the field all night. I think the Dogs play a good game for a while but that’s about it. come close but Florida is the better team.